The high point of my trip to Paris was Père Lachaise Cemetery and visiting Jim Morrison’s grave. Père Lachaise is like stumbling upon a forgotten corner of an old estate and stepping into some sort of beautifully morbid fairyland. It’s gorgeous, old, and decaying in the most wonderful way… you just can’t curate this kind of patina! 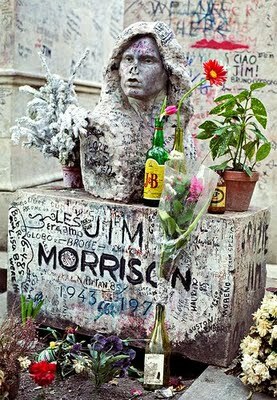 A visit to Jim Morrison’s grave has been on my wish list since 1991, when I first saw The Doors movie and fell madly in love with the sound of Ray Manzarek’s organ music, Jim Morrison’s American Prayer, and the closing shots of the Cemetery. Back then, it seemed improbable that I’d ever make it to Paris, let alone to Père Lachaise to see Jim Morrison’s grave, but here I am! Visiting Jim Morrison’s grave is a pilgrimage of sorts for a lot of people and the atmosphere is exactly what I expected. Strangers of all ages from all over the world come to share the experience of visiting one of their favorite rock idols. Everyone is respectful, allowing plenty of time for each person to get their photo op. Some are happy just to take a photo in front of the security fence. For the more adventurous fans, the group will help you over the fence and keep a collective eye out for security (which I have an strange feeling looks the other way for the most part). Rebellious girl that I am, I managed to scale the fence in those heels and that itty bitty skirt, sit on Jim Morrison’s grave, get photos of it, and cross back over without getting caught. It was definitely one of the top 10 experiences of my life! Pere Lachaise!! I’m seriously envious. I went to Paris 9 years ago but missed Pere Lachaise. So, of course, I have to go back to Paris. Great photo of you and Jim:). Looking forward to more photos of Paris. I applaud your moxie! What a great picture. Enjoy the rest of your trip. I was the one that took the picture of the bust you linked to. I was in the military at the time and went to Paris with some buddies on leave. It was so cold and windy that morning, 1986 or 1987. I was so hung over but I had to have the shot. To bad the bust is gone. Ruth, You must go back and see that cemetary! Even if it weren’t for my encounter with Jim, it still would’ve been an amazing day, I’ve never seen anything like it. It was my best day in Paris! Hello, came over via Bluebird Baby. Pere LaChaise was one of my favorite places in Paris and I must have a picture of the bust somewhere. What an adventure you are on, happy travels! Awesome photo, hope to get there someday!